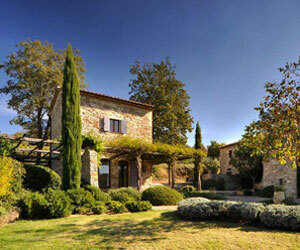 Casa del Leone is one of ten 5-star luxury villas available to rent on a private estate of Castello di Reschio. This private estate covers 2,000 acres of Umbrian countryside with expansive views of rolling hills, olive groves and vineyards and forests of ancient oak and chestnut trees. Little has changed since St. Francis of Assisi preached here in the Middle Ages. Casa del Leone is a charming family home with magnificent views over the private nature sanctuary of the estate of Castello di Reschio. There are extensive mature grounds and gardens, which include a woodland walk, an ancient olive grove and recently planted and now productive vineyard of Merlot and Cabernet Sauvignon grapes. A 14m x 7.5m overflow swimming pool, with changing room, bread oven and dining area make a wonderful private area for carefree outdoor summer living. Enter into the entrance room and dining area, to the right is the fully fitted kitchen that has access to the outdoor dining area. Forward from the entrance is the living room with fireplace and access to the outdoor dining area and pool. To the left of the entrance is a family study with a fireplace and cloak room. Beyond the study is the laundry room and boiler room. Up the stairs and straight ahead is a double bedroom with en suite bathroom. To the left from the stairs leads into a spacious living room. To the right of the sitting room is the master suite with a double bedroom and an en suite bathroom. Beyond the living room is a hallway that has external stairs and that leads to a double bedroom with bathroom and a double bedroom with en suite bathroom. In the garden is a large infinity pool with a pool house that has showers and a bathroom. Connected to the pool house is a bread oven.